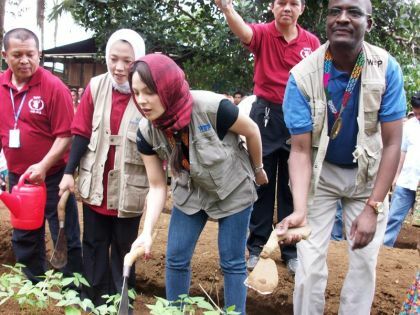 Islamic City of Marawi (07 December) -- Actress KC Concepcion, the World Food Programme (WFP) Philippine Ambassador Against Hunger, took time out from her showbiz career and visited Piagapo town in Lanao del Sur province yesterday. KC joined some WFP officials spearheaded by Asaka Nyangara, the Country Deputy Director, to launch the Protracted Relief and Recovery Operations (PRRO) in the province. She personally participated in the feeding program for school children in Bobo Elementary School, gave Plumpy Doz to babies in the town's rural health unit, and visited the communal garden projects of Piagapo women. Piagapo is one of the poorest municipalities in Lanao del Sur with 79.5% of its population living below the poverty line. It is also one of the seven selected towns covered by PRRO program of the WFP. In Piagapo alone, about 5,200 children in 30 schools are being served by the WFP emergency school feeding program while 372 pregnant and lactating women as well as 471 children aged 6-23 months are being assisted by the WFP supplementary feeding program. Piagapo ABC President Amroussy Macatanong expressed appreciation to the WFP officials for choosing to launch the PRRO program in Bobo Elementary School. He said it is a big help in their campaign to address the nourishment of their pregnant and lactating mothers and eradicating hunger among their growing children.